When Fiat launched a GT special edition at the Geneva Motor Show, it gave the Abarth version of the 124 Spider a major upgrade in style. The 124 GT blends improved looks and a slight increase in performance. On the outside, the special edition wears a unique shade called Alpi Orientali Grey. 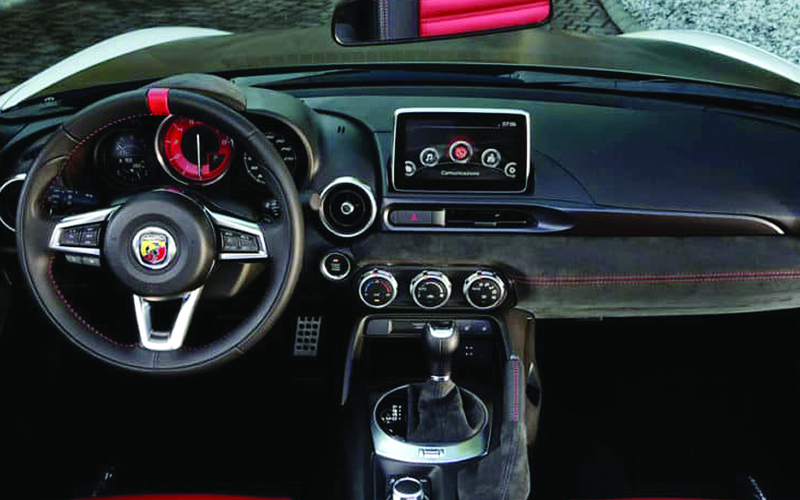 The mirror caps and front fascia also receive a gunmetal gray finish, and the roadster rides on a set 17-inch wheel, which Abarth claims shave 6.6 pounds (3 kilograms) over the stock parts. The sound proofed carbon fibre hard top brings the 124 into the world of grand touring. At just 16kg, the hard-top has an excellent power ratio and weight distribution, and thanks to the large rear window, the 124GT offers excellent rear visibility. Easy to take on and off, you can change the look of your 124 in minutes. It is, however, fully lined, with a heated rear window, and the cool new look it gives the car harks back to classic Abarth Group 4 rally cars of the 1970s. Lightweight OZ Racing alloy wheels further this image, as does the Heritage pack option, which gives a matt finish to the bonnet and bootlid. “As in the ‘70s, the latest generation Abarth 124 is now offered in hard-top version. A reference to Abarth tradition evolved in design and technology. The metal, fixed hard top of its forerunner, is replaced with a removable version, made of strong and light race inspired materials,” the official statement read. The GT retains the Abarth 124’s 1.4-liter turbocharged four-cylinder, which produces 168 horsepower (125 kilowatts) and 184 pound-feet (250 Newton-metres) in the European market. Buyers can choose between six-speed manual or automatic gearboxes. The mill gets the roadster to 62 miles per hour (100 kilometres per hour) in 6.8 seconds and a top speed of 144 mph (232 kph).